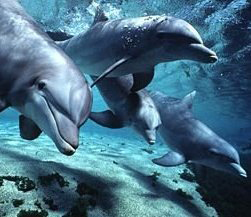 More and more people are feeling attracted to dolphins due to their innate sense that the dolphins can help them. Yet it is not possible, or practical, for everyone who loves dolphins to go to swim with them in the ocean. In a dolphin energy healing session, you receive the same energy that you would receive if you were swimming with the dolphins physically…and often more! In a session, you and your Divine Self co-create your experience with the energy and consciousness of the dolphins. Because the dolphins live in the Oneness, they serve as a bridge to All That Is. You set the intention for what you would like to receive from the session, and your Dolphin Energy Practitioner holds the space for the healing and transformation to occur. The practitioner also serves as a vehicle for the dolphin love energy to flow through. The practitioner does not manipulate this energy in any way. Healings can be given in person or remotely by telephone. It’s always amazing how profound these remote healing sessions can be – there truly is no difference if the client is on the massage table or in another part of the world. Enter into the healing session with an open heart and mind. Release all expectations. Be open for your highest good to occur. Be clear in your intention to release any and all limiting thoughts, beliefs and behaviors that no longer serve you; and be open and willing to receive the higher vibrational frequencies that do. Consider investing in a series of sessions. While each session is profound, the healing process is an unwinding of the old, and a bringing-to-the-surface of what’s real and true. A series of sessions allows for the deepest release and the highest level of awakening to occur. What Can I Expect From a Dolphin Energy Healing Session? ~ Do you want your heart to be more healed and whole? More open? Do you want more love in your life? Heart healing is an area of specialty of the dolphins, both the physical heart and the spiritual heart. As our hearts heal and become more whole, we are better able to give and receive love in our lives, starting with ourselves. Your entire quality of life will improve when your heart is more healed and whole. ~ Are you feeling overwhelmed, depleted, directionless, depressed? Fill your cup with Dolphin Love, Joy, Insight & Inspiration. Dolphins hold the vision of a JOYful and LOVE filled life for all of us. If you’re not living in Love and Joy much of the time, Dolphin would love to share their gift of healing energy with you. ~ Are you seeking the return to health, well being, and wholeness on the physical level? Emotional? Mental? Spiritual? All of the above? Dolphins are master healers. They don’t work in a linear way, on one issue or one area at a time. The dolphins are holographic and multidimensional. They are able to make adjustments on multiple levels simultaneously. The more open you are, and the more permission you give, the more they can do in a single session. The Frequency of Joy is a transforming engine. Joy raises your base frequency and elevates your awareness to a higher state of being. From this higher state of consciousness, perceptions shift in a heartbeat, and transformation occurs quickly and easily. Dolphin Energy Sessions are deeply transformative! ·A Good Place to Start!